I've received all the responses I can analyse without paying for a membership at Survey Monkey, so I'm starting to look at the results I have for the TAC Campaign Effectiveness Survey. First up, let's look at the respondents' answers regarding this latest campaign, the 'Motorcycle Reconstruction' ad. There are 58 responses making up these results. The most interesting aspect of these results to me are the fact that for all questions bar 2, the largest answer group was "not at all." All the questions were phrased in terms of an active response from the viewer - does the ad make you think about, change, or use - in response to the ad. Overwhelmingly it appears that these viewers were not influenced by this campaign at all, at least so far as these questions go. The two questions that defied this trend related to whether the ad focused upon the consequences of an accident, and whether the respondent considered themselves to be the target audience of the ad. Some of the optional comments entered shed further light on this. For example one respondent commented that they already wear all the protective gear all the time, and do not speed. 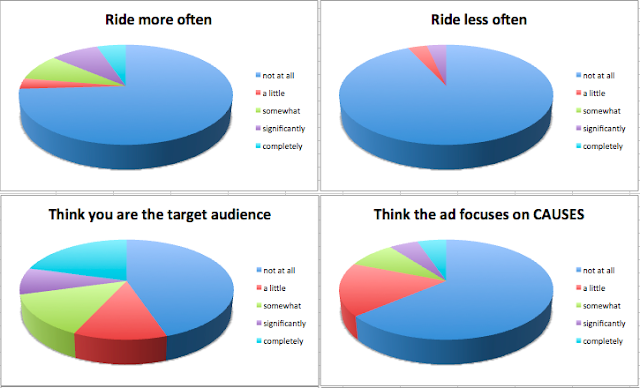 Since none of the questions asked whether a riders current practices and habits were reinforced or supported by the ad, this riders' choices are likely aligned with the goals of the campaign, but the campaign cannot be said to have contributed towards changing their attitude on those subjects. Whether the ad reinforced that behaviour however was not assessed. That 67% of respondents indicated that the ad made them think about how they ride their PTW "not at all" should be an alarming outcome for the TAC. I stress that this is not a professional survey, and these are not "findings" and are not put forward as a scientific statistical analysis. All I am presenting this as is a informal survey of viewers' responses to the ad. 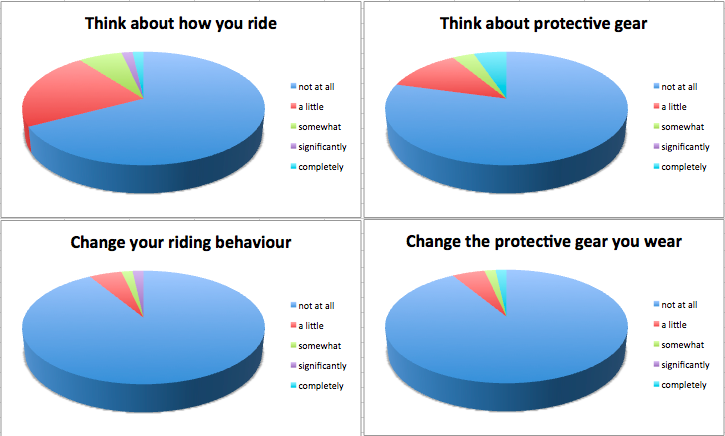 But that 67% of responses indicated that they didn't think about their riding behaviour at all in response to the ad surprises even me. I am not a fan of this ad and consider it a lamentable waste of an opportunity to make a real impact, but despite that it did prompt me to think again about road-craft skills that would help save a rider in this predicament. For two thirds of respondents to walk away from this ad without asking those questions is a pretty damning indictment of this campaign in my opinion. Two more themes jump out at me from this question. 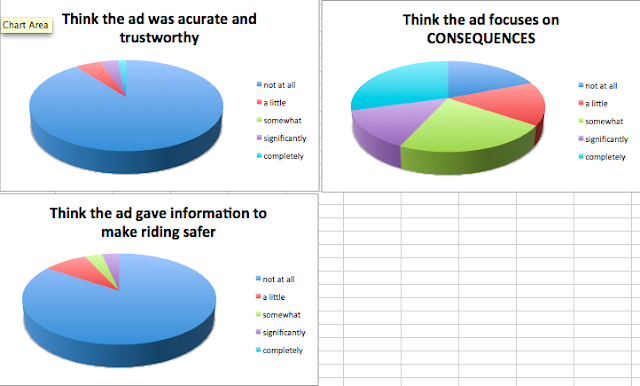 Firstly, it paints a picture of mistrust of the TAC, with 89% considering that the ad was "not at all" trustworthy and accurate, 84% saying that the ad did not provide any information to make riding safer, and 60% believing that they were not at all, or only a little, the target audience of the ad. Secondly, 63% of people responded that they didn't think the ad addressed the causes of accidents at all. If I were the TAC I would be taking a three-pronged approach to addressing motorcycle safety in response to this campaign. I would commission a new ad focusing on driver behaviour. While the accident statistics indicate that other vehicles are involved in only 50% of motorcycle fatalities, that 50% is certainly fair game for trying to lower motorcycle accidents. Furthermore, such a campaign would demonstrate that the TAC is listening to the concerns of riders and is prepared to do something about it. The idea in my head is something along the lines of "Is that gap big enough? If you don't know, don't go." The other idea is to picture a driver checking left and right before pulling out, counting the seconds they spend looking "1 motorcycle, 2 motorcycle" in the same way that American kids are portrayed as counting "1 mississippi, 2 mississippi ..."
I would look at the causes of motorcycle accidents with only passing reference to consequences. This seems to go against the grain of TAC's track record of emotive advertising, but in my opinion the TAC is allowing their messages to get muddied by their overpowering focus upon consequences. Of course that is to an extent understandable since the TAC literally pays for those consequences; however preventing accidents is preferable to minimising the consequences of accidents, and visuals such as a rider wearing all the right gear dying from a broken neck do nothing to aid the clear communication of how to prevent a crash. Causes and road-craft should be the major focus of this three-pronged approach. Consequences also need to be addressed, as riders have the ability to influence how significantly they are injured in a number of accidents. Again, this topic would be handled separately from causes, and would focus on unpreventable or "no fault" accidents where a cause has to be included at all. Ideas such as a child running into the path of an oncoming car that then swerves into the path of a rider, or a rider passing a truck as the truck tyre blows out and flings rubber at the bike spring to mind. The aim here is to get away from the whole "well I just wouldn't have ridden like that guy rode, therefore I can turn off from the rest of the ad" syndrome, and allow the viewer to engage with the examination of consequence mitigation, mostly dwelling on protective gear. Well done. I agree particularly with #3: Ads focussing on the "no-fault" scenarios to improve roadcraft. Is there oil on the road, is there a pot-hole that I didn't see coming because I was too close up the back of a car, perhaps an animal running out on the road? I would say and emphasise "perhaps" a very similar scenario to the current TAC ad, where the driver pulls out from a blind spot, but hearing the rider beforehand, asking "is that a blind spot on the left? what's my road position? Is there a car about to turn out? What's my speed? There is a car - slow down. Are there any cars behind me? Ok the car's seen me, his wheels aren't moving, ok to go again." I guess that is similar to the previous campaign switching positions with the driver. I would also comment that since the current TAC campaign was launched, I've had many non-riders (car drivers) commenting to me about the ad. All of them didn't see anything wrong with the driver pulling out from the stop sign into the path of the rider. They all believe the bike to be 100% at fault, and somehow think it's ok. Puzzling. Nice one TAC. Ross, these results could be used by VMAG. Has anyone from VMAG got in touch with you? Good work Ross, I agree with all three of your concepts. Motorcycle safety is a complex area, but there definitely are things that can be done to address problems, both in terms of motorist awareness (and credit where it is due, the 'put yourself in their place' add was a good start in that area. As for cuases, again agreed, this is imprtant, if only because I think a focus on this is needed to get the message across credibly. Sure speed is at times a factor - but portraying it as *one* factor in a way that doesn't just demonise the rider is a really important idea that has so far been missing. *All* motorists need to be aware of speed issues (hell, I get overtaken all the time riding on the freeway to and from work and I'm travelling at the speed limit the whole way). But that is a message that is frankly stale from overuse - not just to motorcyclists, but to the driving public in general. Look instead at where speed is a factor, and how awareness and good roadcraft suggests you do need to slow down, quite possibly to something well below the posted limit, in order to be safe. Tackle the more complex issues in rider safety - believe me, riders will appreciate that and respond a lot better. I definitely agree a no-fault scenaio is a really useful way to approach the issue and to re-engage riders who have been feeling persecuted by the current approach.